This week in Washington, the American-Israel Public Affairs Committee, a pro-Israel group, has been holding its annual conference. About four-in-ten Americans (41%) said U.S. support for Israel has been about right, according to a survey conducted Oct. 2012. A quarter (25%) said U.S. policy was not supportive enough while 22% said it was too supportive. 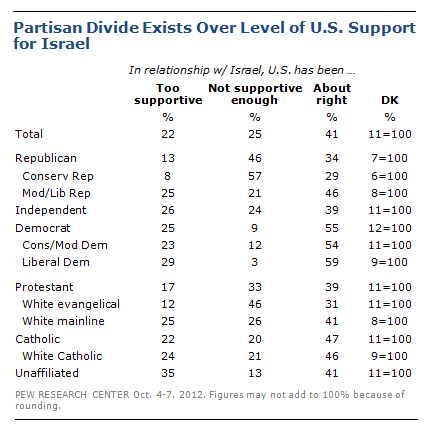 A majority of Democrats (55%) consider the level of U.S. support for Israel about right compared to 34% of Republicans. Conservative Republicans stand out for their belief that the U.S. has not been supportive enough of Israel. Fully 57% of conservative Republicans said the U.S. has not been supportive enough of Israel.